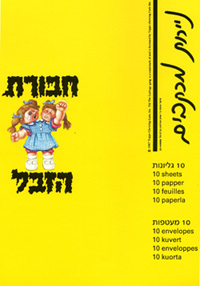 Israel released a version of Garbage Pail Kids called HAVURAT HA'ZEVEL that included multiple series, inserts, collector albums, and merchandise. 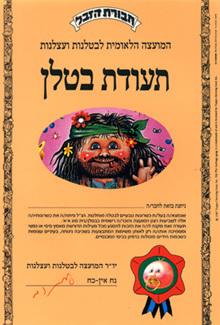 Israel released three series of their own version of Garbage Pail Kids called Havurat Ha'zevel. These releases closely resembled the Japanese Bukimi Kun release, involving the same characters, sticker design, and numbers. All the characters used in the 'HH' set were original Garbage Pail Kids images. 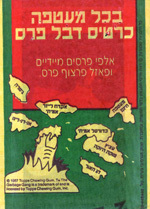 However, the Israel release mixed things up a bit and used the 'back' images from the United States release on the front of some of their cards. The backs of these cards were just plain cardboard. 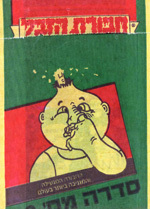 Often times countries would release Garbage Pail Kid-themed merchandise with their sticker sets. These products varied greatly in terms of quality, but they are typically some of the most sought-after pieces to collect. 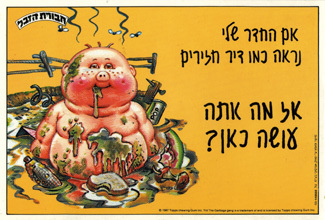 Given the success that Garbage Pail Kids were having, Israel decided to release some additional 'Garbage Pail Kids Themed' merchandise. 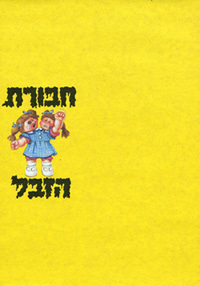 Like most foreign releases, the Israel sticker set was accompanied by albums. These albums were released one per series and contained blank spots for peeling and sticking the stickers. Also, these albums were used to advertise merchandise and products that might appeal to the collector. 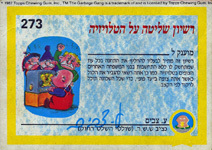 On the back page of the Series 3 album were advertisements for both 'Garbage Pail Kids Certificates', 'Garbage Pail Kids Room Signs', as well as 'Garbage Pail Kids Stationary'. I am lucky enough to have 2 of the certificates in my collection, as well as one of the signs and a set of the stationary. The certificates are roughly 6" x 8" and are laminated for protection. 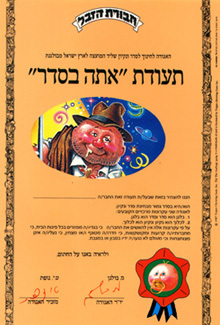 The front of the certificate contains an image of a GPK, as well as text. It is signed at the bottom. The back of the certificate is blank. The sign measures 7.75" x 9.5", and is laminated for protection. The front of the sign contains an image of a GPK, as well as text. The text on the signs does not translate perfectly to English (see translation below). The back of the certificate is blank. "If your room looks as a pig pen so what are you doing into?" 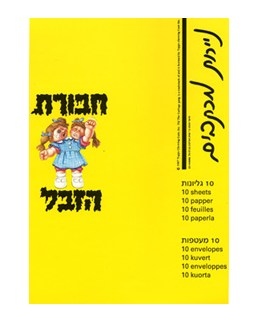 The stationary consists of 10 single-sided sheets of paper featuring a character from GPK, as well as 10 envelopes featuring Explorin' Norman. Also included is a 'cover' that provides details as to what is in the package. 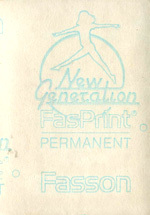 The sheets of paper are extremely thin and would need to be folded a number of times to fit inside the envelope. Lastly, a series of POGS have been located by collectors that appear to be loosely tied into the Garbage Pail Kids artwork. 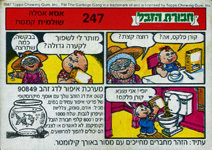 While a number of different examples exist, there are only a few that have characters displaying GPK-styled-children. I have included an example below.